The National Literature Centre or Centre national de littérature (CNL) is a cultural institution established by the government in 1994 and governed by the law of 25 June 2004. 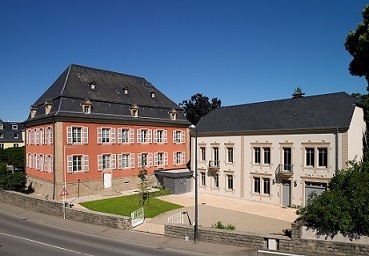 It is located at the Maison Servais and the Maison Becker-Eiffes in Mersch. As a literary research institute open to the public, the CNL specialises in the documentation and analysis of Luxembourgish literature and hosts a variety of literary and cultural events. The Centre has a reading room, an exhibition space, conference rooms, a library holding over 40,000 books and archives, which ensure the long-term preservation of more than 350 collections. Two fully furnished studios are available to writers-in-residence, researchers and lecturers. These studios are located in the Maison Becker-Eiffes, adjacent to the Centre’s public garden.